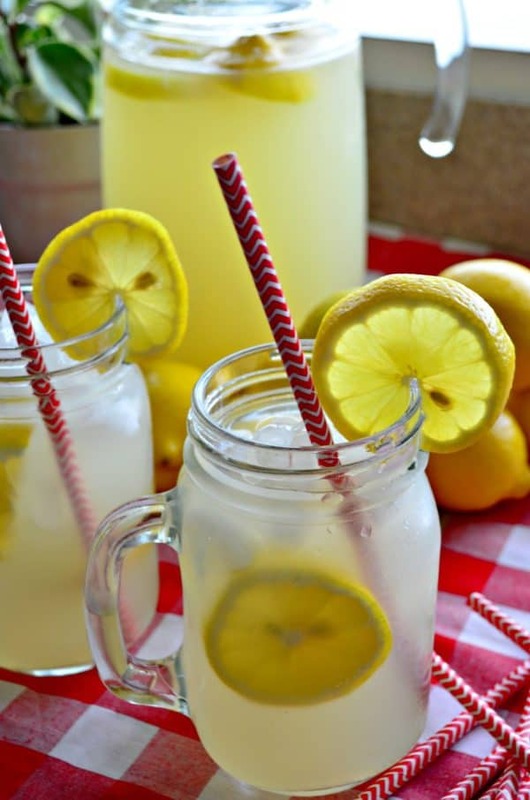 Cool off and pour yourself a big old glass of my homemade lemonade recipe. 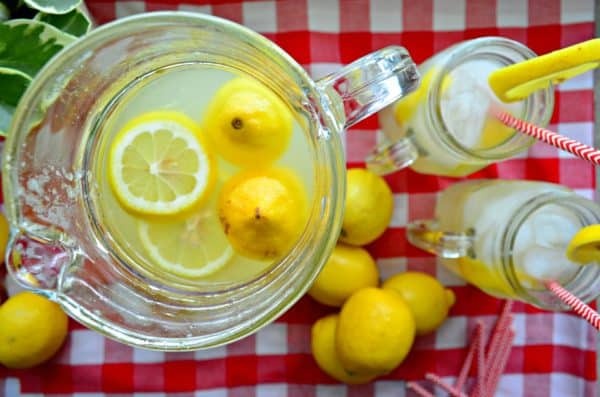 Three ingredients needed to make the best homemade lemonade around! It’s hot and one thing that I’ve indulged in all summer is homemade lemonade. I can’t get enough of it and usually have at least 1-2 glasses a day. 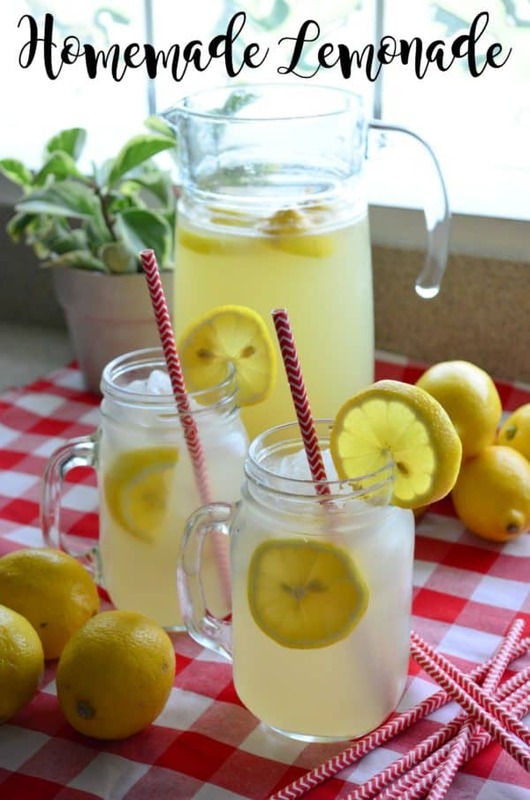 I love my homemade version because I can control the sugar and although there is a lot of sugar in it–it’s far less than what you get from the lemonade found in stores. Plus I love the tart/sweet ratio that I just haven’t found in any store-bought lemonades. 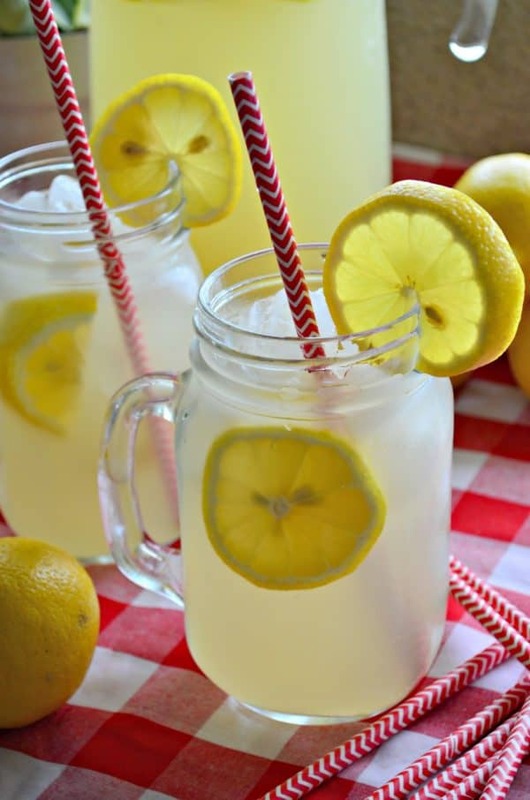 If you love lemonade from a fair or festival then you’ll love my recipe for homemade lemonade. It’s spot on taste the same as you get at the outdoor festivals. It’s always the first thing my husband and I grab when going to our yearly art festival. We love the freshly squeezed lemonade. I like to not waste anything. I actually boil the rinds of the squeeze lemon in with my simple syrup. I feel that it gives the lemonade an extra layer of flavor! Then I use a strainer and strain out the lemons and let the lemon simple syrup fall into the glass pitcher. I also take a wooden spoon and push out any excess syrup to make sure I get all the good juices! I keep the pitcher in my refrigerator with a little plastic wrap and sip on the lemonade throughout a few days. Sometimes this one pitcher only makes it a day in my refrigerator–just depends on how thirsty everyone is in our home. I try to ration it out and I almost always add a little more water to every glass to stretch it a little further! Just a side note, I used a hand-held lemon juicer to squeeze out the juice–so it takes a little bit of time, but totally worth it! If you have an electric one it will take you no time at all! 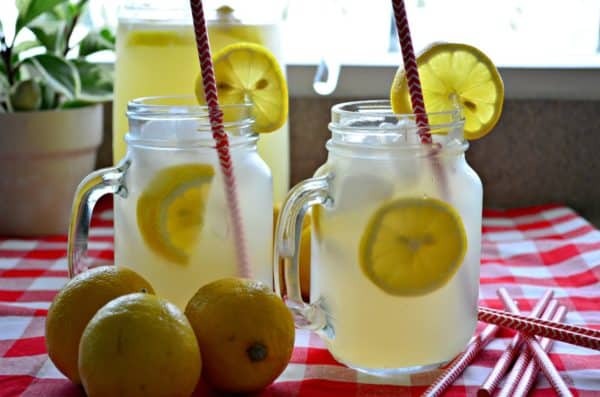 So if your like me, and want to cool down this summer make a big pitcher of my homemade lemonade recipe. Slice lemons in half, and juice until all juice has been removed from the lemons. Do not discard the lemon rinds, set them to the side. In a large saucepan combine 4 cups water and sugar. Mix on high until sugar is dissolved then add all the lemon rinds to the pot. Heat for 10 minutes then turn the burner off and let sit for 20 minutes. Strain the lemon simple syrup into a pitcher then add in the fresh lemon juice and 2 cups of cool water. Chill until cold and serve over ice. It’s been my go-to all summer long!